Buyers will be provided with all local and delivery distributors' information in their immediate service areas with applications for each. Take advantage of the technology out there and use email billing, credit card processing, route scheduling and mapping, client details, and much more. Companies that will do all of your billing for you for a monthly fee. No more envelopes, printing, ink cartridges, lost bills, stamps, ignored emails, or mailing. There are a few major tradeshows throughout the year that offer education as well as seminars for many of the products and free giveaways of new products. Tradeshows are a great way to extend your pool knowledge and really just get together with great people involved in the pool industry. We will provide you with details for all upcoming shows. Pool Route Pros, Inc. suggests that anyone with a pool route, whether large or small, have liability insurance to cover their route. There are a few different options out there that will all be explained in detail so you can choose what is right for you. If you decided to expand into other pool industry areas, i.e., large repairs, remodels, building, etc. 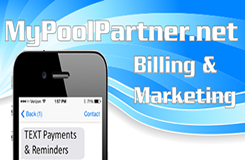 With 30+ years experience in the pool industry, Pool Route Pros, Inc. provides every buyer with a list of referrals for anything you will need: service, repair, general questions, etc. These are referrals that have been built up through Pool Route Pros, Inc. through the years and can answer any pool route service or repair questions that you may run into. This book will give you a list of any and all major and minor repairs relating to a pool. It will also show you the cost to do each job with parts and also give you an idea of what you should charge the customer as well. The Pool Route Pros buyer's packet can be given to our new buyers in either a hard copy or flash drive form, depending on preference.